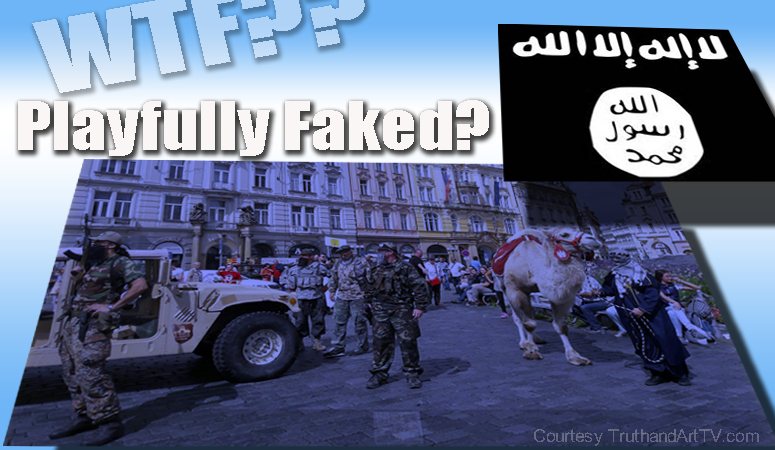 Bizarre ISIS Hoax Attack Staged In Prague Triggers Panic In Streets ... Coincidence? In what is probably one of the more bizarre and intriguing stories of the week an "activist" named Martin Konvicka who runs an "Initiative Anti-Islam" group called “We don’t want Islam in the Czech Republic” organized a highly curious and very bizarre staged ISIS attack with an entourage of his followers-activists smack in the middle of a busy section of Prague Czech Republic. The attack involved a real camel, military gear including vehicles, supposedly "fake" sub-machine guns, and actual ISIS flags. According to sources the staged ISIS attack was "intended to sound the alarm about the possible threat posed by Islam encroaching on the Czech way of life". Confused yet? Konvicka, who is calling this operation a "success" according to his Facebook page said that "We are bringing you the light of true faith", whatever that is supposed to mean. In the bizarre mock attack the "activists" actually fired blanks which to many of the innocent bystanders appeared like a very real attack. Notably, in Western mainstream media's version of the report, Konvicka's role is significantly downplayed to one of mostly an "activist" with potentially a good cause, who pulls off an event he didn't realize would cause so much havoc. The event naturally caused panic in the streets reminiscent of 1938's "War of the Worlds" broadcast where an 'Orson Wells' fake radio broadcast of an alien invasion was assumed to be real by panicking Americans. Mr. Konvicka is an anti-immigration activist, and his stunt, which had been preapproved by City Hall, was intended to sound the alarm about the possible threat posed by Islam encroaching on the Czech way of life. But he evidently did not anticipate how it would be received. The faux occupation stirred panic among tourists, including a group of visitors from Israel. Dozens of onlookers, including some with children, ran for cover, knocking over chairs at restaurants. Several tourists suffered bruises. Aaron Gunsberger, who owns a kosher restaurant in the Jewish quarter, grabbed his gun and ran to the square, fearful that an attack was taking place. The rally that Martin Konvicka's Initiative anti-Islam group organized in the centre of the city on Sunday and that caused panic among tourists ought to have been banned, Prague Mayor Adriana Krnacova (ANO) told journalists on Monday. "This was the absolute failure of an official and I want to draw personnel consequences from this," Krnacova told CTK. Members of the Initiative arrived at the historical Old Town Square on a military vehicle, wearing camo uniforms and leading a camel and carrying an Islamic State flag. They "played" an invasion of Prague by IS. The performance aroused panic among people in the square, mainly foreign tourists. In the morning, the Prague City Hall released its official statement that it could not have banned the rally. Prague officials knew that persons disguised as soldiers will attend the rally that Martin Konvicka's Initiative anti-Islam group organised in the centre of the city on Sunday, but they could not ban the event as they knew no more details, the City Hall said. However, Krnacova said the application for the rally had really included a mention about fake weapons. "However, this is not substantial. The application ought not to have been permitted in the first place," Krnacova said. The police are checking the Sunday rally as breach of the peace. Konvicka told CTK on Sunday that he had mainly wanted to shock the public. "I disagree with the acceptation of migrants, but I do not think it is normal that some people drive across the Old Town Square, arousing fear and panic," Krnacova said. The question awakened truth seekers should be asking then is- was this event just a random hoax intended for fun? Or was this event sponsored by someone higher up? Who is anti-Islam, anti-immigration "activist" Martin Konvicka really? And, why was this event allowed in the first place? Although an attempt is made to answer this latter question in the article linked above about the City not realizing what this was really going to be about and not being able to stop it, it leaves us wondering who to really believe and what was the true intention of this psyop event. Between 2014 and 2015, in particular, became widely known for its open and often nasty criticism of Islam. Increase public awareness of his person is given above all the concerns of a large part of the population from expanding the influence of Islam in the Czech Republic, linked to Islamist terror attacks in Europe, the activities of the Islamic State and European migration crisis. The study of Islam, he has previously, after the terrorist attacks of 11. September 2001. In July 2009, he co-founded Facebook community called Islam in the Czech Republic we don't want, with whom he began to share the knowledge obtained in this way. over time, the number of Facebook fans of this site to which the kettle is connected, most notably increased, and in January 2016, reaching more than 163,000 persons; the community was then blocked by Facebook due to allegedly hate posts and activists moved its activities to the backup page. in the first half of the year 2015 announced intention to enter politics. In June 2015 as "superstructure" initiatives in the Czech Republic we do not want Islam for this purpose, the Association was formed Block against Islam (BPI), chaired by Martin Pot. In his post he was subsequently confirmed in December the same year to the Parliamentary Assembly the BPI. the kettle is originally intended to block against Islam will bring together a number of candidates of political parties and movements with protiislamskymi views. 28 June 1999. January 2015 was a guest of the show, Czech television, Hyde park, where he talked about his perspective on Islam in the Czech and European context. also announced the intention of the legal assault on Islam. Expressing also (his) controversial statements from Facebook, which was later accused of incitement to hatred; ... and it aims to dampen the fear of Islam. In September 2015, Dawn political movement-the national coalition announced that in elections to the regional councils and the Senate in 2016 and in elections to the Chamber of deputies in 2017 will be run jointly with the block against Islam. Electoral superlidrem of this group and his spokesman should become just Martin Pot. in January 2016, then pot, announced that he will stand as a candidate as the leader in the regional elections in the Czech Republic. On 18 July 2005. November 2015 police accused Martin Pot from incitement to hatred against Muslims, namely the offence of incitement to hatred against a group of persons, or to the restriction of their rights and freedoms, which in the case of a conviction could be liable to a penalty of up to three-year six-month imprisonment. ... He argued that it is not directed primarily against Muslims, but against Islam, which he called a "planetary ideology" and repeatedly called for its prohibition. At the beginning of may, Martin Kettle, announced that plans to set up their own political party, at which the members of the original Block against Islam compete for votes. The naming of this party can be an alternative for the Czech Republic, inspired by the German populist right-wing party alternative for Germany. This revealing Wikipedia profile at the very least indicates that Konvicka has a long history as a radicalized militant hater of Muslims, promoter of Islamophobia and "ISIS" terrorism phobia, he is now determined to push his way into the Czech Republic political scene and wants to bring other parties "together" under his radical ideologies in his future political ambitions to presumably run for president of the Czech Republic at some point in the future. Immediately I'm thinking all of these characteristics and ambitions would suit the Western CIA global strategy of tension agenda perfectly. And I'm also thinking it would be prudent of the Czech Republic to exile this radical figure as soon as possible. We should also be asking the simple question of, who benefited the most from this bizarre staged event? We all know the Western US empire does. Those who created ISIS, including the US Intelligence and its NATO partners like Saudi Arabia and Israel benefited the most. Yes, plain and simple, those who armed, trained and support ISIS are the ones who need to keep their ISIS proxy army going and stand to gain the most from a psyop like this. So could it be that Konvicka is just the latest CIA stooge trying desperately to insert himself into the public consciousness of the Czech people to create division and fear? With information now coming out about CIA global "Muslim terrorism" stooge Fetullah Gulan and his connection to not just the CIA, not just Hillary and Bill Clinton, but to the recent failed coup in Turkey as well as terror networks around the world, no one should be surprised by events like these and surfacing characters like Konvicka. All of it makes sense in light of the bigger picture and the West's determination to get their new world order done. The fact of the matter is that this mightily resembles the West's Operation Gladio B which specifically involves the use of "Muslim terrorism" and engineered fear on the world to tear down everyone's sense of safety, to create the backdrop for a future global police state and to destabilize nation states like the Czech Republic. Personally, I have no doubt that this was a planned event very likely funded by the very people who created the ISIS psyop. The timing is even more incriminating. The irony of a psyop like this being orchestrated to create panic in a country free from psyops and ISIS fake terrorism is another tell-tale sign of the West's fingerprint. At a time when ISIS is being flushed out once and for all throughout Syria and Iraq the West needs to keep ISIS and the fear that comes with ISIS in the minds of the people. From this standpoint this event suits the West's agenda perfect and no one should be fooled. Martin Konvicka vaguely reminds me of another person, Richard Gutjahr, the journalist who was recently caught red-handed posing as a random "witness" in BOTH the Nice, France (videotaped event) AND the Munich Germany (live-tweeted) staged terror events. Gutjahr was then exposed as the spouse of an Israeli Mossad agent and even placed his own journalist daughter in Munich Germany to act as a "witness" to that event just a week and a half later. The purpose of both of these false flag staged "terror" events, just like this recent Czech Republic event, was clearly to promote ISIS fear throughout Europe and the world. This latest ISIS staged "innocent" and "activism" psyop event is no different, but you won't hear this on the Western mainstream media news who is looking to downplay this as a random event.